For the Japanese Horror film released as Saimin in Japan, see Saimin (film). Saimin is a noodle soup dish developed by different immigrant groups in Hawaii. Inspired by Japanese ramen, Chinese mein, and Filipino pancit, saimin was developed during Hawaii's plantation era. It is a soup dish that consists of soft wheat egg noodles served in hot dashi garnished with green onions. Kamaboko, cha siu, sliced Spam, linguiça, and nori, among other additions. Saimin shares a great deal in common with Okinawa Soba with regard to noodles and broth, with the biggest difference being the toppings. China and Okinawa had close relations at one time. It is possible that an alternate explanation for the origin of saimin comes from the historical relationship between the two Asian cultures. Japanese pot stickers, called gyoza, as well as Chinese wonton may be substituted for or added to the dish's noodles for special occasions. A pan-fried version, primarily inspired by Filipino pancit, is also popular, especially at carnivals, fairgrounds, and catered parties. Saimin is a compound of two Chinese words 細麵: 細 (pinyin: xì, jyutping: sai3), meaning thin, and 麵 (miàn, min6), meaning noodle. Saimin actually came from China which is how they have the characters. Saimin is recognized as a traditional dish in Hawaii, taking into consideration the various cultural contributions in its creation. The first Asian immigrants to Hawaii were the Chinese from Southern China to trade for sandalwood with the Hawaiians. The second migration of Chinese came to work on the sugarcane plantations. The dish is composed of elements taken from each of the original sugarcane and pineapple plantation laborer ethnicities of the early 20th century: The noodles are of Chinese origin made with Japanese dashi (broth) with ingredients from both cuisines such as cha siu, eggs, and green onions. Through the years, various ingredients are widely accepted to be added into this multicultural dish. As plantation laborers returned from the fields, communal meals were informally prepared. It is believed that on some occasions, a Filipino family may have had extra green onions growing in their yard, the Portuguese had some sausage, the Hawaiians had a couple of extra eggs, and the Korean had some cabbage left over from making kimchi. At this point, they would all throw their ingredients into the pot and share what was created. It may be through these communal meals that saimin was born. Saimin was first popularized as a fast food dish on the plantations and in the twentieth century at Honolulu Stadium. It is served at all sporting venues alongside hot dogs and hamburgers at popular national fast food chains and restaurants throughout the islands. A healthy alternative to most school meals, several public schools offer saimin as a regular option for students. Several saimin establishments including saimin noodle factories and restaurants have become local landmarks in Hawaii and have attracted out-of-state visitors who have ventured off the traditional tourist-beaten paths. Many of these establishments have been officially designated by the State of Hawaii as places of historic interest. Among such establishments are Palace Saimin, Likelike Drive Inn and Washington Saimin on Oahu, and Hamura's Saimin on Kauai, which was given the James Beard Foundation's America's Classic honor in 2006. A serving of McDonald's Saimin. 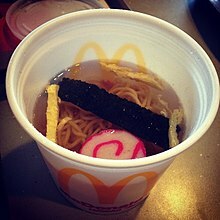 McDonald's, an American fast-food giant based in Oak Brook, Illinois became aware of the saimin phenomenon in the Hawaiian islands in the late 1960s. Maurice J. "Sully" Sullivan, legendary Hawaii entrepreneur and owner of Foodland Super Market Limited, had purchased and opened the first McDonald's restaurant in Hawaii in 1968 at his flagship grocery store. He opened several more McDonald's franchises, and for 12 straight months, McDonald's Hawaii became the highest grossing group of franchises in the world. Sullivan wanted to serve his favorite meal, saimin, at his McDonald's restaurants, knowing all too well that his restaurants would boom with its introduction to the menu. Sullivan invited executives from the McDonald's corporation, including owner and business tycoon Ray Kroc for dinner at two family-owned, "hole-in-the-wall" saimin stands in Honolulu. They ate at Palace Saimin, Washington Saimin and Boulevard Saimin. That night, Sullivan convinced Kroc to expand McDonald's menu for the first time in its corporate history to include a local "ethnic" food. Researchers worked extensively with Washington Saimin to develop a recipe for McDonald's Hawaii. Sullivan secured deals with Ajinomoto, a local Japanese saimin noodle factory and fishcake supplier, to manufacture a special soup base. Today, saimin is one of McDonald's Hawaii restaurant's most popular menu items. Later, Sullivan introduced breakfast platters consisting of Portuguese sausage, eggs, and steamed white rice; Spam, eggs, and rice; and a Breakfast deluxe, a combination of the two, to his menu, capitalizing on the local food phenomena. ^ Katherine Nichols, "Hamura's Saimin Stand on Kauai is a 2006 James Beard Foundation honoree", Honolulu Star-Bulletin, April 30, 2006.